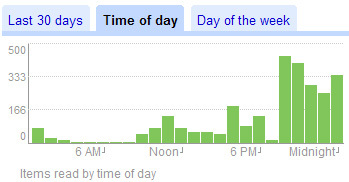 Reader Trends, added today to Google Reader, provides a lot of insight into a user’s feed reading behavior. For instance, the graphs of my reading habits are very informative and confirmed that I do most of my feed reading late in the evening and on weekends. I’m really impressed with the Trends page and I’m looking forward to seeing Google do more with our feed data. I see two big issues, though. The first is related to it’s handling of read items. I don’t think it can tell the difference between a feed that you constantly mark as read without actually reading any articles and a feed that you carefully read each item, very aware that when you hit J(next item), you’ll be marking each article read. So some forum feeds which I rarely browse are mixed with ones I actually read a lot (like www.scobleizer.com, Make Magazine and Engadget) in my most read list. To drive this point home, I’ll note that the trends page says “From your 93 subscriptions, over the last 30 days you read 2,771 items, starred 143 items, and shared 140 items.” I have not scrolled past 2,771 items this month. Er…. HAVE I? The second big issue (for me) is that the new Trends page is yet another piece of Google Reader that doesn’t work on my Nokia 770 which has a VERY CAPABLE Opera browser. The page loads, but none of the tabs work. I spent a few minutes looking into adding the Trends information into ReaderMini (my mobile front end to Google Reader), but it looks like I’ll have to translate a lot of links and I may have to include a bunch of CSS to get it working. I put it on the todo list and I’ll hopefully get to it this month. The ‘inactive feeds’ list is very helpful and may lead to a recategorization of my feeds. Update: I agree with Steve Rubel. I’d like to opt in for the ability to share my personal Google Reader trends with others. I’d even love to put some of the lists and charts in my blog sidebar. Meanwhile, Andrew Parker links to what end up being an excellent resource for finding apps like this. He calls them MyWare. I’ve been looking for something like trends to allow me to know which feeds I should delete. I was also disappointed with its inability to distinguish “mark all as read” from actually reading an individual article. For now, I disabled the feature to auto mark as read when scrolling in expanded view, so I have to manually mark articles as read. Of course this has many disadvantages, but I want to be able to see accurate read % trends.